We recently announced a webinar on September 18th about why it’s good to use assessments for compliance. Today I’d like to focus on how to use them, particularly within financial services organizations – for whom mitigating risk of non-compliance is essential. 1) Internal exams — Internal competency exams are the most commonly used assessments in financial services. 2) Knowledge checks — It’s common to give knowledge checks or post-course tests (also called Level 2s) immediately after training to ensure that the training has been understood and to help reduce forgetting. These assessments confirm learning and document understanding. 3) Needs analysis / diagnostic tests — These tests measure employee’s current skills in topics and help drive decisions on development topics. They can be used to allow employees to test out when it’s clear they already understand a particular subject. 4) Observational assessments — When checking practical skills, it’s common to have an observer monitor employees to see if they are following correct procedures. A key advantage of an observational assessment is that it measures behavior, not just knowledge. Using mobile devices for these assessments streamlines the process. 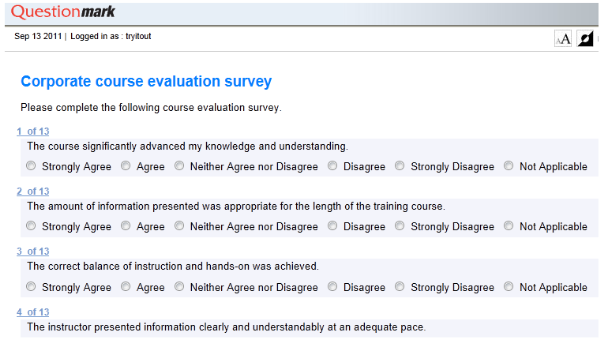 5) Course evaluation surveys — “Level 1” or “smile sheet” surveys let you check employee reaction following training. They are a key step in evaluating training effectiveness. In the compliance field You can use them to gather qualitative information on topics, such as how well policies are applied in the field. Here’s an example fragment from a course evaluation survey. 6) Employee attitude surveys — Commonly used by HR for measuring employee satisfaction, these surveys also can be used to determine attitudes about ethical and cultural issues. 7) Job task analysis surveys –How do you know that your competency assessments are valid and that they are addressing what is really needed for competence in a job role? A job task analysis (JTA) survey asks people who are experts in a job how important the task is for the job role and how often it is done. Analysis of JTA data lets you weight the number of questions associated with topics and tasks so that a competency test fairly measures the importance of different elements of a job role. 8) Practice tests — Practice tests often use questions that are retired from the exam question pool but remain valid. Practice tests are usually accompanied by question and topic feedback. As well as allowing candidates to assess their further study needs, practice tests give candidates experience with the technology and user interface before they take a real exam. 9) Formative quizzes— These quizzes are those we are all familiar with: during learning to inform instructors and learners about whether learners have understood the learning or need deeper instruction, they diagnose misconceptions and also help reduce forgetting. They provide the key evidence that helps instructors vary the pace of learning. Computerized formative quizzes are especially useful in remote or e-learning where an instructor cannot interact face-to-face with learners. 10) 360- degree assessments – This kind of assessment solicits opinions about an employee’s competencies from his/her superiors, reports and peers. It will usually cover job-specific competencies and general competencies such as integrity and communication skills. In compliance, such surveys allow you to potentially identify issues in people’s behavior and competencies that need review. Click here for details and registration for the webinar, 7 Reasons to Use Online Assessments for Compliance. You can download the white paper, The Role of Assessments in Mitigating Risk for Financial Services Organizations, here.